Using the Virtual Tissue module with Stereo Investigator, a series of photos of each kidney section was captured using the 5X objective and then automatically stitched together to form a montage of the entire section of kidney that clearly represents the degree of injury. Kidneys are from mice treated either with vehicle (0.3 M sodium bicarbonate) or a single injection of folic acid (250 mg/kg, ip) in sodium bicarbonate. The mice were euthanized after 14 days. Injection of folic acid has been used as one model of chronic kidney disease. 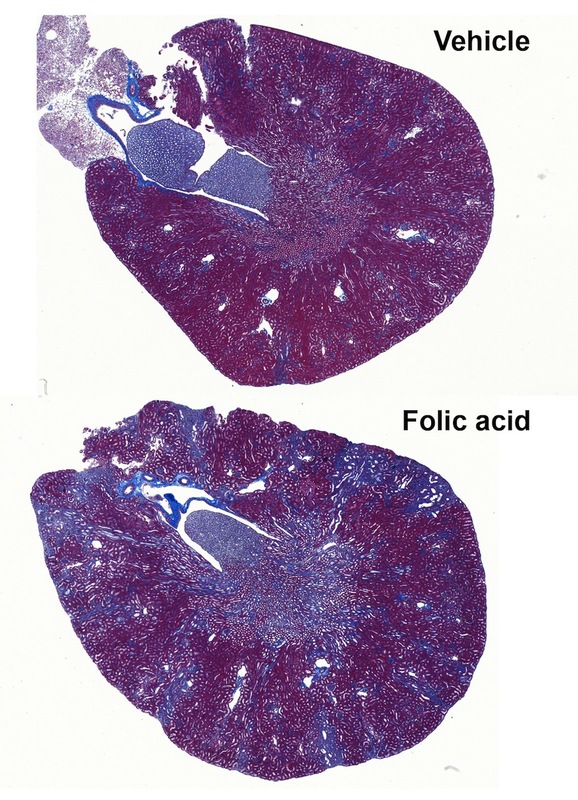 The degree of fibrosis in the kidney, revealed here by Masson’s trichrome stain (blue: collagen deposition), was determined using the area fraction fractionator probe in Stereo Investigator. When it comes to health, kidneys are critical. From regulating blood composition to maintaining calcium levels, the pair of bean-shaped organs perform several essential tasks. Needless to say, interruption to kidney function can be disastrous. Working with scientists in South Korea, researchers at the University of Virginia found a surprisingly simple treatment for renal ischemia-reperfusion injury (IRI) in mice, which is a model of acute kidney injury (AKI) in humans. The researchers found that mice exposed to ultrasound prior to IRI “had preserved kidney structure and function accompanied by a reduction in tissue inflammation,” they report in their paper published this month in the Journal of the American Society of Nephrology. Revitalizing research from the 1980s that suggests ultrasound exposure induces an anti-inflammatory effect, the research team found that ultrasound stimulation does indeed calm the immune system’s response, reducing swelling and subsequent damage to the kidney. In the process, they solved a longstanding mystery about the mechanism behind this phenomenon, determining that the stimulation of an anti-inflammatory pathway in the spleen is essential to the process. The pathway, known as the cholinergic anti-inflammatory pathway, relies on the spleen, CD4+ T cells and the a-7 nicotinic acetylcholine receptor (a7nAChR) to modulate inflammation, the authors say. To get an exact measure of kidney damage in IRI mice, the scientists used unbiased design-based stereology to quantify injured tubules. Using the area fraction fractionator probe in Stereo Investigator the scientists saw that mice exposed to ultrasound twenty-four hours prior to IRI showed significantly less injury. The researchers measured a damaged surface area covering 18.8 percent of the kidney section surface in IRI mice, while ultrasound-treated mice displayed a damaged area measuring only six percent. Posted in Customer News, Software and tagged acute kidney injury, Customer Research, kidney research, Stereo Investigator, Stereo Investigator Case Studies, Stereo Investigator Customer Research, ultrasound, university of virginia.